a cooling/pumping station, and a chilled water piping network. Makai Ocean Engineering, Inc. has completed a contract funded by the Office of Naval Research (ONR) through the Hawaii Natural Energy Institute (HNEI) to research and develop Seawater Air Conditioning (SWAC) technology. 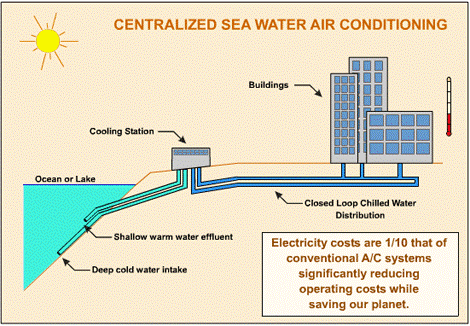 SWAC is a method to provide cold air conditioning to buildings using a district cooling system that uses an available cold water reservoir as its source (usually deep cold water from a lake or ocean). SWAC can provide air conditioning using about one-tenth of the energy required for conventional air conditioning. The Navy has recently expressed interest in implementing SWAC district cooling systems at island bases using the Energy Savings Performance Contract (ESPC) model.